Last time I wrote about Sea Spray, which is just down the road from today's topic - Gulf Ridge Community. Slightly larger than Sea Spray, Gulf Ridge has about 60 homes/homesites, with some being direct gulf front properties! Gulf Ridge also has two pools and two tennis court for your enjoyment! This community is located near the J.N. Ding Darling National Wildlife Refuge and also just a short drive to Blind Pass and Captiva Island. Over 20 miles of biking/walking trails are located at the entrance to this community! Currently there are four homes listed in Gulf Ridge. The asking prices start with a three bed, three bath for $760,000, up to a four/four for $3,990,000. There is currently one vacant property available - over an acre for $469,000. Contact me for all the latest information on our island listings! You can also watch a video tour of Gulf Ridge on My Webpage. Sanibel is starting to get busy with our winter season almost upon us! Our islands are colorfully decorated for the holidays and we have lots of events coming up. This is a great time to think about looking at island properties! We have a great inventory, and I'm sure I can find just the right location for you. For Sanibel homes available, we have 209 currently listed in our multiple listing service. The asking prices start with a 3/2 for $250,000. 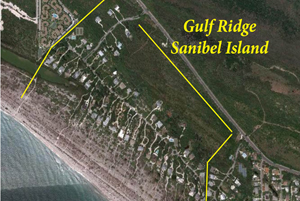 For Sanibel condos, we currently have 193 listed, starting with a 1/1 for $129,000! You can see that we have something for everyone! You can search our MLS Here. I also want to tell you about my latest listing. It's a homesite located in Sea Oats Subdivision (off West Gulf Drive). This is one of the few remaining vacant lots in Sea Oats, one of our most sought after communities. The property offers views of conservation property, and includes a deeded beach access just a short walk or bike ride away. The asking price is only $315,000! Contact Me or call 239-691-4915 for more information. You can check out Sea Oats with a video tour on my webpage.